The Hotel Arco de la Villa sits right on the edge of the mountain in the beautiful white village Zahara de la Sierra, very close to the old Moorish fortress, and surrounded by the Grazalema Natural Park. 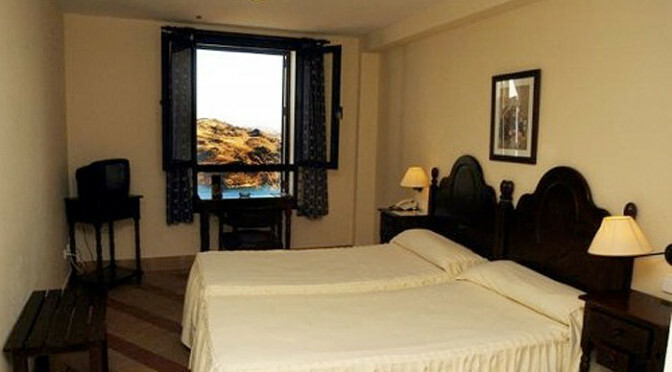 Built in 1998, the hotel provides comfortable accommodation and views of the lake at Zahara that cannot be matched. Sixteen double rooms and one single room are offered, all rooms being air conditioned, and include a television, phone, and Wi-Fi Internet. Within the hotel there is a restaurant serving local cuisine, and in the village guests will find a decent range of other restaurants including modern contemporary styles. Reception is manned 24 hours, with staff knowledgeable about the local area. Booking and more information here…. From the hotel the fortress in Zahara is only metres away with spectacular photo opportunities of the tower, lake, and the white village. Zahara de la Sierra has won national awards for cleanliness and civic pride, and is a delightful village for gentle strolls, and is filled with history at every turn. In the nearby vicinity, the lake beach can be visited, and a little out of town there is a large swimming pool with picnic areas and its own sandy beach. The Natural Park is all around, and Zahara is a great jumping off point to explore the Garganta Verde gorge and admire the Pinsapar (Abies pinsapo) forests that are unique to the district.